Searching for a fine dining restaurants in Pigeon Forge to celebrate your anniversary, birthday, graduation, or other special occasion? While there are several Pigeon Forge restaurants to choose from, few offer the fine dining options that Bullfish Grill affords its diners. Enjoy unique twists on regional favorites crafted by their stellar chef. From delicious steaks to seafood, burgers to barramundi, these dishes will tantalize everyone's taste buds. No matter if you stop in for lunch, dinner, or Sunday brunch, the appetizing offerings of the Bullfish Grill make it a scrumptious choice for any meal. 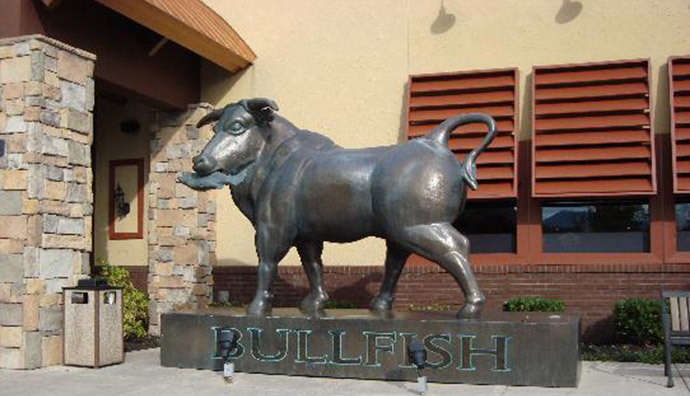 Don't bother searching for any other Pigeon Forge steak restaurants - Bullfish provides a delectable variety of food with something that everyone in the family is sure to enjoy. Lunch - Whether you're in the mood for a juicy burger, Southern corn chowder, or a classic Po' Boy, lunch at the Bullfish Grill stand apart from other Pigeon Forge restaurants' lunch offerings. From paninis to meatloaf lunch plates, each dish at Bullfish offers something delicious to curb your hunger through your next exciting Smoky Mountain adventure. Dinner - After finishing an exciting day of attractions in Pigeon Forge, there are several fine dining restaurants in Pigeon Forge to choose from for a scrumptious meal to end your day.To start you meal off, enjoy fried green tomatoes or spinach artichoke dip. Bullfish Grill's delectable dinner entrees included Mahi Mahi, crab cakes, filet mignon, and, that Southern classic, shrimp and grits. After you've finished your entree, make sure you save room for the funnel cake apple stack or the strawberry cake. Additionally, Bullfish offers an extensive drink menu for that perfect accompaniment to your meal. Sunday Brunch - While many Pigeon Forge restaurants offer brunch, Bullfish Grill offers a fine dining twist on some of your breakfast favorites. Enjoy a creme brulee french toast topped with caramelized pecans and brown sugar or the Chesapeake Bay Benedict, two jumbo crab cakes on English muffins topped with two poached eggs and Hollandaise. There are plenty of other choices for fine dining in Pigeon Forge and the surrounding area. Pigeon Forge steak restaurants as well as Pigeon Forge seafood restaurants provide your family with the chance to enjoy quality meals in the Smokies. At Cabins USA, we strive to provide our guests with quality information on things to do and places to eat in the Smokies. A stay in one of our Pigeon Forge cabin vacation rentals places you close to all the Pigeon Forge restaurants, attractions, ans shopping that is sure to make you vacation to the Great Smoky Mountains a memorable one.